Posted on Wednesday, November 18th, 2015 at 11:48 am. TaiwaneseAmerican.org’s special correspondent, Esther, recently met up with Sports Host/Anchor of FOX Sports Southwest in Houston’s Chinatown to talk about his career path, family, and passions. As one of the very few Asian Americans in the sports broadcasting industry, he is driven to make change in his hometown and through national broadcasts. It all starts with good bowl of Taiwanese beef noodle soup. We are one of the first customers at Star Snow Ice; it opened just minutes ago at 11:00 am I had asked if he wanted to meet at a Starbucks, but Howard Chen suggested Chinatown. “I’m a Chinatown addict,” he texted me. Who am I to turn that down? Never mind the heat is making October unbearable for a Chicago native like me, as soon as we enter the restaurant, Chen is excitedly recommending the beef noodle soup – a hot dish. It’s one of his favorite Taiwanese foods. Again, who am I to turn that down? He orders in Mandarin. We pick a table in the middle of a sea of tables. He gets up to grab utensils. He gets up again for some hot sauce. He is a ball of energy. Our two hot bowls of beef noodle soup arrive fast, but not fast enough, as Chen has already covered several topics, including his cute baby niece. He says he’s lucky to be in Houston, just hours away from her. 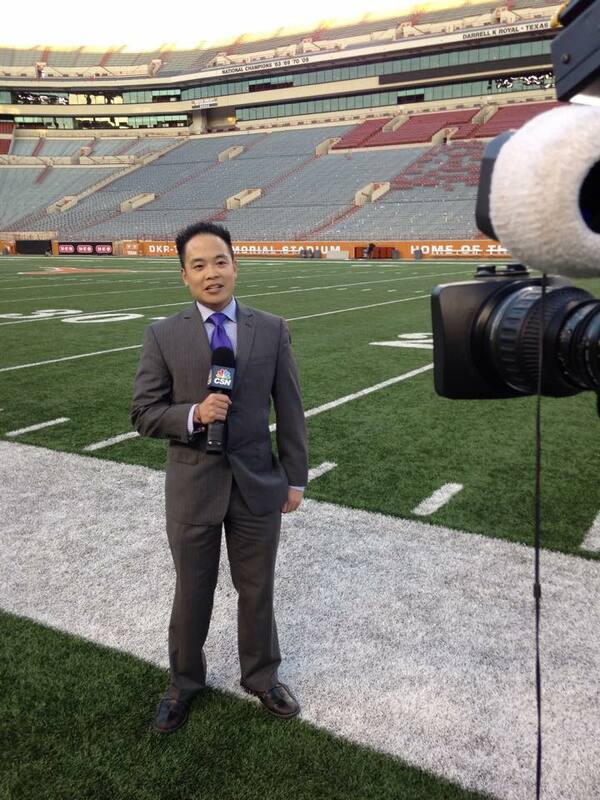 With his father’s work ethic, Chen began his career in college, interning at a variety of places, including Sports Radio 610 in Houston. Like many journalists, his first job was in a small market – Zanesville, Ohio. 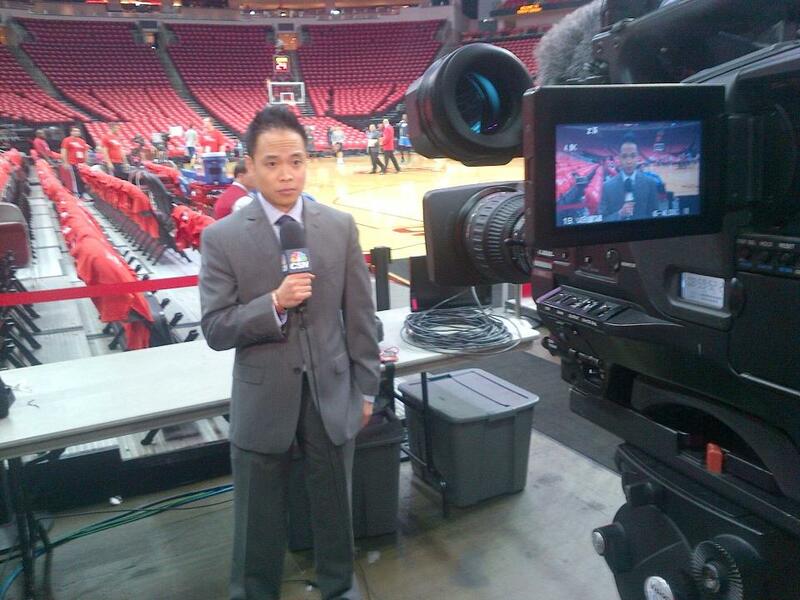 He ended up working in the state for a decade, before landing a job with Comcast Sports Network in Houston. 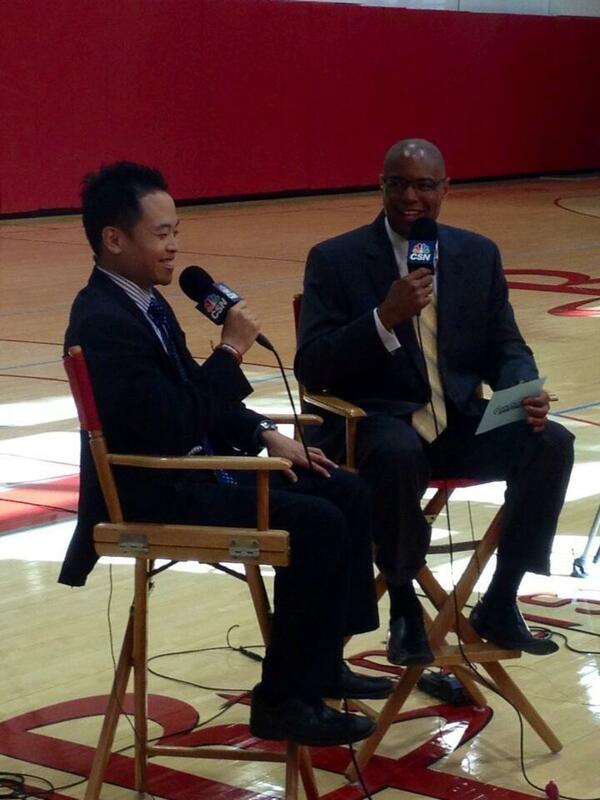 “It’s very rare for somebody to be part of a game broadcast that they grew up watching. I grew up watching Rockets and Astros game broadcast.” Working at CSN, he says, was a check mark on the list of “big goals” in life. That in itself is already a deviation from the stereotypical Asian American experience. Not just talking about sports but seeing it. “I feel like I’m witnessing history.” Chen lists off the big moments he has witnessed: Lebron James’ first breakout game in the playoffs, where he scored 54 points. NBA all-star weekend in Houston. NBA playoffs. Yet, for all his mentions of basketball, he says his favorite sport is football. We wrap up our conversation at the restaurant, which is packed now. He suggests a bubble tea shop across the street. This man is full of good ideas about Taiwanese food. It’s something he appreciates, after spending his 20s in cities with a dearth of Asian cuisine. With good food, a good job, and his proximity to family, I ask him if he ever plans to leave Houston. Esther grew up in Chicago and now works as a writer. She enjoys coddling her dogs, brunch, working out, and a spellbinding book. A good day would include all of those activities along with a hearty bowl of 牛肉麵. Meet Actor Hudson Yang from ABC’s Fresh Off the Boat [PHOTO] Taiwan: Through the Lens of an ABT Maggie Hsu – Co-founder of Mochi Magazine for Young Asian American Women Hanging with Albert Tsai and the Cast of Dr. Ken!